Great Product. Leaves my skin feeling soft and smooth. Very light scent that will not interfere with any fragerance you may wear. One of the best lotions I have used, at a fraction of the cost of the designer named products. Bottles are very large. This product will last a very long time. I just moved and after packing an unpacking boxes, my hands were raw from handling packing paper and cardboard. I bought this lotion on recommendations, and am thrilled with the result. My cuticles and the cracks in my hands have been been restored, and the rest of me is softer. I moved just 4 years ago, and used a different lotion - that didn't work. Only time healed my hands. I know I should wear gloves, but when you're packing fragile things (dishes, glasses, etc.) the grip doesn't feel secure enough. I am not always too keen on trying something new on my skin. I heard from someone that Dermasil had come out with a new and better formula so I tested it out. This product definitely has my skin moisturized and soothed for an all day feel. I like it cause even on these humid days or cold days it absorbs just right....not leaving a sticky feeling like some lotions do. Love this lotion!! I am so pleased that it is ultra nourishing but not at all greasy - it absorbs into my skin very quickly. Highly recommend this product! I was looking for a good and moisturizer body lotion for a long time. Finally, I got this Newest & Most Advanced Dermasil Cocoa Butter All Day Body Moisturizer. The price is reasonable and the quality is excellent. I have a very dry skin, only this product can get rid of my dry skin and keep it moisturized. I highly recommend to people who have very dry skin like me. Absorbs quickly into the skin and doesn’t feel tacky or greasy. I can dress immediately after applying. My skin stays and looks moisturized throughout the day. My 10 year old loves it, she actually reminds me to buy it. We have tried a lot of things as she has a disorder that causes her to itch a lot, but this works!!. My skin appears smoother and softer after just a few days. It actually feels nourished throughout the day, not just after it’s applied. I just wanted to tell you how much my husband and I enjoy your products! We were first introduced to them from a pin on Pinterest. They have found their way into our shopping cart ever since! They most definitely have helped our issues with dry skin due to cold, Wisconsin winters! Thank you again for your commitment to making such a great product! I bought some Dermasil Labs Nourishing Hand Cuticle Cream with Shea Butter when i was in the US last month and I can't believe how it has helped my hands. My nails developed ridges and broke before within an hour. This cream has not only helped my nails to grow, but they have developed a smoothness and have softly hardened that is unreal. I actually can be proud of all my nails except my thumb nails which are getting better. I really want to get some more but don't know where. Thanks. Hello my name is Erin Parsons from Lansing MI. I have very sensitive skin and have had a hard time finding lotion that I like and that does not bother me. One of my big issues is if it does not bother my skin then it smells bad. Well I found your lotion at a drug store and it both smells great and works. Right now I only have the original lotion but I am willing to try all of your products. I have a bottle on my desk at work and all the women come and use it. Thanks for making something us sensitive skin people can enjoy. Thank you for such an awesome product!" "I would like to thank you for creating such wonderful lotions! I recently purchased my first tube of Dermasil Dry Skin Treatment lotion last month, and haven't stopped using it since! Not only did it lock in moisture for at least two days, but it also left my skin with an amazing healthy glow. I can't thank you enough. I'll never switch to another cream. I'm hooked! " "I found your cream in the Dollar Tree Store and it was very effective in repairing and clearing an "uncomfortable" exema type skin situation that I had on the palm of my hands â€“ I thought that it was an allergic response to something that I touch in the garden or perhaps the soil but it wouldn't go away. I was using recommended products form my dermatologist for about 8 months and they did not do the trick. Thanks for this product." "I want to go on record as saying that Dermasil has got to be the best product on the market that I have ever tried. There should be absolutely no reason to buy any other brand. The effects start immediately and I am truly satisfied with the results. Thanks for such a wonderful product"
"My name is Christina and I LOVE your Dermasil original dry skin lotion. I have very dry, sensitive, pale skin that seems to be irritated by most everything. It's hard for me to find a really good lotion that actually doesn't dry out my skin or make it irritated! I originally got your lotion because I got a tattoo and was advised to buy a healing lotion. Upon reading the bottle and seeing that it took away symptoms like itching, redness, dry flaking, and soreness, I decided that it was the lotion for me. Not only did my tattoo come out perfect and smooth, but I began using it all over my body and am still amazed 3 months later how many compliments I get on my smooth, moisturized skin. I also got a major sunburn in July and used Dermasil twice a day everyday for a week and my sunburn became completely healed! I recommend this lotion to everyone and buy several tubes at once now! Thanks for giving people like me an amazing product!!!!!" "Dermasil is the first lotion I have been able to find that actually has helped with my severely dry skin on my legs. They are now coming back to life :) which I thought would not happen . thank you for such a wonderful product." "Hello- just a quick message to let you know that you have a AWESOME product... our son is 6 years old and has suffered with VERY sensitive skin since birth, usually any lotion makes it worse.... your product is truly amazing, this is the first lotion he is able to use and not react.... it is AWESOME!!! Thank you so much and if you have a catalog or some information on ordering by mail please send it our way as we will need more in the future. Thank you so much this is amazing!" "I have severe eczema on my hands every winter and this winter I tried Dermasil Lotion for the first time. I want to thank you for manufacturing such a wonderful product!! I use your lotion every day and have had no breakouts of eczema this winter. I have tried every lotion imaginable up to now and nothing has given me relief from my eczema like your lotion. My hands were always scaly, itchy, and ugly looking during the winter months. Not this year, though! Thank you so much!!" Great for dry and itchy skin. Non greasy and a mild smell. Its good for everyday use. The pump makes it convenient to use. I am enjoying this product. I had a horrible situation after a manicure, my fingers were put in 100% acetone and my skin was falling off it was horrible, but this lotion really helped me. The texture is just right in my opinion, it is creamy enough but not to thick, which I personally do not like. I would definitely recommend, I don't necessarily have extra dry skin but it most definitely helped me keep my skin moisturized. Great moisturizing lotion. Goes on smooth and creamy, never greasy and moisture last through handwashing. The softness really does last 24 hours.Excelent for extremely dry skin. I love how creamy and thick this moisturizer is especially during the harsh winters! Not greasy feeling and absorbs easily into skin leaving it feeling soft and smooth. Not overpowering fragrance but light coconut scent. A little bit goes a long way with this product due to how thick and creamy it is. I can tell a noticeable difference in my skins moisture level after only one use. This is a great lotion. It comes in a pump bottle, which I love! It smells very good, very sweet (I feel like a sugar cookie, but donâ€t worry the scent doesnâ€t last too long) and itâ€s very moisturizing! I love putting this on after a shower and my skin feels soft all day! "Amazing story here my son is 6 years old and suffers daily and nightly from moderate to severe eczema.. For the past 5 years we have followed the advice of dermatologists and pediatricians to buy the most expensive products on the market...these lotions did nothing to help my son. We used prescriptions lotions and steroid creams. These steroid creams caused concern because they can be dangerous if used the wrong way and not were safe for his face. One night he woke up and asked me how long did have to live like this... heart broken and very defeated I saw no relief for my 6 year old child. Thank you so much for this life changing product I want to go back and buy it all up before I cant find it anymore...."
"I am 46 years old single mother, with two teenagers and we live in New Bern, NC. About six years ago I developed a very bad case of dermatitis on my hands. It was so bad I hated to take a shower or brush my teeth. Cleaning my house seemed impossible. I would end up with even more painful and broken hands. Wearing gloves did not help. Doctors prescribed different creams. I felt better for a short while but my problem did not go away. Some of the cream thinned my skin so badly I was cutting my self with anything, even my own nails. Needles to say I was devastated by constant pain, itching and burning. One year ago I noticed a Dermasil cream for hands at the Dollar store different than anything I seen before. Very carefully I used the small amount from the sample bottle and waited to see how my hands were going to react. After 1- 15 minutes I felt my hand were soft again and my itching was less and less bothering my hands. I was still suspicious. After two weeks my hands cleared about and my skin became and of normal thickness, no redness, blisters, cracking or itching. I went back to the store and bought all cream that was left. I was eczema free the whole year. I looked for this cream for a long time in different stores, but I did not find it yet. Please help me. I am out of your cream and my hands are again painful, hurting, cracking and full of blisters. Where can I find you product in my area?" "I truly trust and believe in the quality and the benefits of Dermasil . At 45 I'm happy to say that my skin has a youthful glow. Dermasil is the only dry skin care treatment that works on my skin; it keeps the moisture in and makes my skin soft, and healthy looking. I for one greatly appreciate your dedication to providing the highest quality products for your customers; keep up the good work." "I suffered from dry, itchy skin since I was in my twenties, especially in the winter. I enjoy skiing and outdoors, and DermasilAdvanced made a huge difference, because it is pharmaceutical grade, has 4 layers of protection, and it is non-greasy. I used to be embarrassed with my dry legs and feet, but now, all that is gone. Thank you for a great product. " "Couple of years ago I was diagnosed with xerotic eczema. I have a hectic lifestyle, don't drink enough liquids, and don't wear gloves in the cold whether. 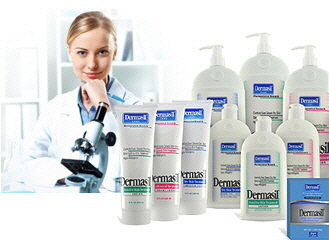 I tried many moisturizers and dry skin lotions, and I found Dermasil original. I started to use it and in days I noticed it works the best for my hands. I am also happy with the price tag. Many thanks to Dermasil Labs. " "Name-brand deals: We've been disappointed in the quality of off-brand laundry detergents and toilet bowl cleaners at Dollar Tree. But a window cleaner made by an Oldsmar company is as good as Windex. And for rough hands, the 8-ounce Dermasil was a steal compared to $7.99 for similar moisturizers at CVS." "I found dermasil lotion and boy am I happy! I am on a fixed income so I can't afford all those fancy smancy lotions and I don't need all those thick heavy ones. Dermasil is just right for using on my hands, face and feet (at night). During a recent trip out of town, I found myself without any lotion. I was thrilled to discover Dermasil at a local store. I was even more thrilled to discover that it is a "Cruelty Free" product, an ever important issue considering I'm vegan.